Joseph Ternbach: Conservator - Collector, The Queens Museum, Flushing, New York, 1984-1985, no. 57. The Currency of Fame: Portrait Medals of the Renaissance, National Gallery of Art, Washington, D.C.; The Frick Collection, New York; National Gallery of Scotland, Edinburgh, 1994-1995, no. 12, repro. The Portrait in Renaissance Italy: From Masaccio to Bellini, Gemäldegalerie, Staatliche Museen zu Berlin; The Metropolitan Museum of Art, New York, 2011-2012, no. 119, repro. (shown only in New York). Armand, Alfred. Les médailleurs italiens des quinzième et seizième siècles. 2nd ed. 3 vols. Paris, 1883-1887: 1: 21, no. 20. Migeon, Gaston. "La collection de M. Gustave Dreyfus, V: Les plaquettes." Les Arts 80 (August 1908): 10, no. viii. Hill, George Francis. A Corpus of Italian Medals of the Renaissance before Cellini. 2 vols. London, 1930: no. 167. Hill, George Francis. 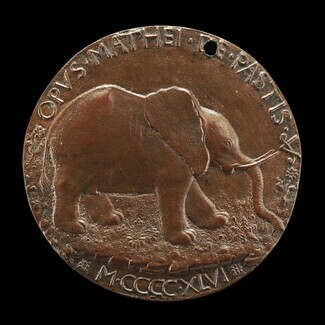 The Gustave Dreyfus Collection: Renaissance Medals. Oxford, 1931:no. 59. Middeldorf, Ulrich and Oswald Goetz. Medals and Plaquettes from the Sigmund Morgenroth Collection. Chicago, 1944: no. 21. Hill, George Francis, and Graham Pollard. Renaissance Medals from the Samuel H. Kress Collection at the National Gallery of Art. London, 1967: no. 59. Sasser, Elizabeth. "Reflections upon the Sources and Iconography of the Elephant in the Sculptural Decoration of the Malatesta Temple at Rimini" Explorations in Renaissance Culture 5: 46, fig. 3. De Lorenzi, Giovanna. Medaglie di Pisanello e della sua cerchia. Museo del Bargello, Florence, 1983: no. 28. Middeldorf, Ulrich and D. Stiebral. Renaissance Medals and Plaquettes. Firenze, 1983: no. 26. Pollard, John Graham. Italian Renaissance Medals in the Museo Nazionale of Bargello. 3 vols. Florence, 1984: 40. Pasini, Pier Giorgio. "Matteo de'Pasti: Problems of Style and Chronology." Studies in the History of Art 21 (1987):146-147, repro. Luciano, Eleonora. "Diva Isotta and the Medals of Matteo de'Pasti." The Medal 29 (1996): 6-10, fig. 2. Glinsman, Lisha Deming. 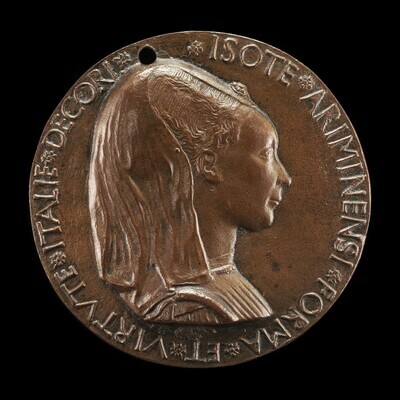 "Renaissance Portrait Medals by Matteo de'Pasti." Studies in the History of Art 57 (1997): 99, fig 10. Pollard, John Graham. Renaissance Medals. The Collections of the National Gallery of Art Systematic Catalogue. 2 vols. Washington, 2007: 1:no. 31, repro. Pasini, Pier Giorgio. Il tesoro di Sigismondo e le medaglie di Matteo de' Pasti. Bologna, 2009: repro. 58.